Posted By:@AVGJOhanna | At:9:44 PM Be the first to comment! Call it righteous indignation, anger, or just flat out pissed off, President Obama plainly voiced his displeasure with what occurred today in the Senate chamber. He was clearly not a happy President and I am not a happy citizen. Common sense legislation...if 40% of gun sales do not include background checks, it only makes sense to expand the law to the remaining 40%. It should not be a hard argument to make in and of itself. Add to this common sense measure the fact that 90% of the country is in favor of it. No brainer...common sense right? Well my quote of the past couple of years is that common sense is not so common; clearly everyone does not have it. I really do not have the words to eloquently voice my disgust. My hope now is that we do not grow weary and just give up. It looks like we are in a 10-round fight and like the President has said, this is just round one. Here is the transcript of the President's remarks as provided by the White House Press Office. I have highlighted what I think are his most poignant statements. THE PRESIDENT: A few months ago, in response to too many tragedies — including the shootings of a United States Congresswoman, Gabby Giffords, who’s here today, and the murder of 20 innocent schoolchildren and their teachers –- this country took up the cause of protecting more of our people from gun violence. I’m going to speak plainly and honestly about what’s happened here because the American people are trying to figure out how can something have 90 percent support and yet not happen. We had a Democrat and a Republican -– both gun owners, both fierce defenders of our Second Amendment, with “A” grades from the NRA — come together and worked together to write a common-sense compromise on background checks. And I want to thank Joe Manchin and Pat Toomey for their courage in doing that. That was not easy given their traditional strong support for Second Amendment rights. As they said, nobody could honestly claim that the package they put together infringed on our Second Amendment rights. All it did was extend the same background check rules that already apply to guns purchased from a dealer to guns purchased at gun shows or over the Internet. So 60 percent of guns are already purchased through a background check system; this would have covered a lot of the guns that are currently outside that system. 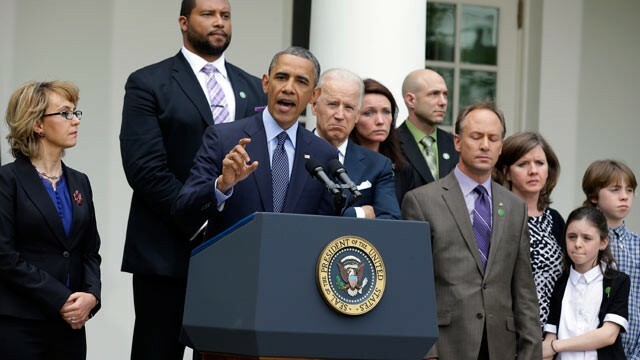 Their legislation showed respect for gun owners, and it showed respect for the victims of gun violence. And Gabby Giffords, by the way, is both — she’s a gun owner and a victim of gun violence. She is a Westerner and a moderate. And she supports these background checks. In fact, even the NRA used to support expanded background checks. The current leader of the NRA used to support these background checks. So while this compromise didn’t contain everything I wanted or everything that these families wanted, it did represent progress. It represented moderation and common sense. That’s why 90 percent of the American people supported it. But instead of supporting this compromise, the gun lobby and its allies willfully lied about the bill. They claimed that it would create some sort of “big brother” gun registry, even though the bill did the opposite. This legislation, in fact, outlawed any registry. Plain and simple, right there in the text. But that didn’t matter. And unfortunately, this pattern of spreading untruths about this legislation served a purpose, because those lies upset an intense minority of gun owners, and that in turn intimidated a lot of senators. And I talked to several of these senators over the past few weeks, and they’re all good people. I know all of them were shocked by tragedies like Newtown. And I also understand that they come from states that are strongly pro-gun. And I have consistently said that there are regional differences when it comes to guns, and that both sides have to listen to each other. But the fact is most of these senators could not offer any good reason why we wouldn’t want to make it harder for criminals and those with severe mental illnesses to buy a gun. There were no coherent arguments as to why we wouldn’t do this. It came down to politics — the worry that that vocal minority of gun owners would come after them in future elections. They worried that the gun lobby would spend a lot of money and paint them as anti-Second Amendment. One common argument I heard was that this legislation wouldn’t prevent all future massacres. And that’s true. As I said from the start, no single piece of legislation can stop every act of violence and evil. We learned that tragically just two days ago. But if action by Congress could have saved one person, one child, a few hundred, a few thousand — if it could have prevented those people from losing their lives to gun violence in the future while preserving our Second Amendment rights, we had an obligation to try. And this legislation met that test. And too many senators failed theirs. I’ve heard some say that blocking this step would be a victory. And my question is, a victory for who? A victory for what? All that happened today was the preservation of the loophole that lets dangerous criminals buy guns without a background check. That didn’t make our kids safer. Victory for not doing something that 90 percent of Americans, 80 percent of Republicans, the vast majority of your constituents wanted to get done? It begs the question, who are we here to represent? I’ve heard folks say that having the families of victims lobby for this legislation was somehow misplaced. “A prop,” somebody called them. “Emotional blackmail,” some outlet said. Are they serious? Do we really think that thousands of families whose lives have been shattered by gun violence don’t have a right to weigh in on this issue? Do we think their emotions, their loss is not relevant to this debate? So all in all, this was a pretty shameful day for Washington. But this effort is not over. I want to make it clear to the American people we can still bring about meaningful changes that reduce gun violence, so long as the American people don’t give up on it. Even without Congress, my administration will keep doing everything it can to protect more of our communities. We’re going to address the barriers that prevent states from participating in the existing background check system. We’re going to give law enforcement more information about lost and stolen guns so it can do its job. We’re going to help to put in place emergency plans to protect our children in their schools. To all the people who supported this legislation — law enforcement and responsible gun owners, Democrats and Republicans, urban moms, rural hunters, whoever you are — you need to let your representatives in Congress know that you are disappointed, and that if they don’t act this time, you will remember come election time. To the wide majority of NRA households who supported this legislation, you need to let your leadership and lobbyists in Washington know they didn’t represent your views on this one. The point is those who care deeply about preventing more and more gun violence will have to be as passionate, and as organized, and as vocal as those who blocked these common-sense steps to help keep our kids safe. Ultimately, you outnumber those who argued the other way. But they’re better organized. They’re better financed. They’ve been at it longer. And they make sure to stay focused on this one issue during election time. And that’s the reason why you can have something that 90 percent of Americans support and you can’t get it through the Senate or the House of Representatives. So to change Washington, you, the American people, are going to have to sustain some passion about this. And when necessary, you’ve got to send the right people to Washington. And that requires strength, and it requires persistence. And that’s the one thing that these families should have inspired in all of us. I still don’t know how they have been able to muster up the strength to do what they’ve doing over the last several weeks, last several months. And I see this as just round one. When Newtown happened, I met with these families and I spoke to the community, and I said, something must be different right now. We’re going to have to change. That’s what the whole country said. Everybody talked about how we were going to change something to make sure this didn’t happen again, just like everybody talked about how we needed to do something after Aurora. Everybody talked about we needed change something after Tucson. And I’m assuming that the emotions that we’ve all felt since Newtown, the emotions that we’ve all felt since Tucson and Aurora and Chicago — the pain we share with these families and families all across the country who’ve lost a loved one to gun violence — I’m assuming that’s not a temporary thing. I’m assuming our expressions of grief and our commitment to do something different to prevent these things from happening are not empty words. I believe we’re going to be able to get this done. Sooner or later, we are going to get this right. The memories of these children demand it. And so do the American people.